Facebook is introducing small changes from time to time for easy reference or tagging of friends while publishing new status updates and replying. We already know easy way to tag and mention Facebook friend by using @ symbol followed by friend name. Now Facebook provide similar friend name automatic suggestions when you start typing a friend name in the Share status text box. This makes adding reference to specific friends or tagging them in specific status update message much easier and quicker than before. 1. After Facebook login head to over Share status box at the top of the page. For example: Type Parmi to allows Facebook to show possible friend tagging suggestions automatically. 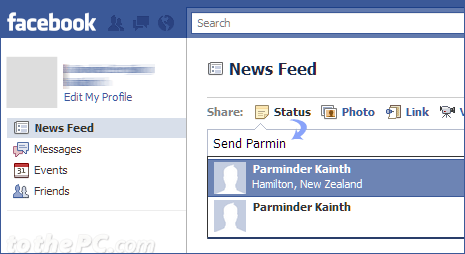 If you type parmi (with first alphabet not capital), Facebook wont show friend tagging suggestions at all. So from now on, if you want to quick mention specific Facebook friend in status update either use @ symbol method or Type starting characters of Facebook friend name with first alphabet being capital. Friend tagging for sure results in more user interaction as all recipients of your status update can click through specific tagged friend in the update message (and maybe start interacting with tagged friend as well).